Some news about the Christmas Doctor Who Special . . . 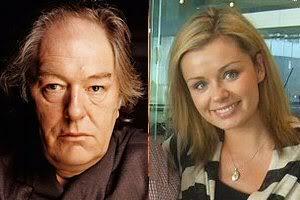 The BBC has confirmed veteran actor Michael Gambon (Professor Dumbledor of Harry Potter Fame) and opera diva Katherine Jenkins will guest star in the 2010 Doctor Who Christmas special. The Christmas episode will be set on a Victorian planet (some filming scheduled today until the 23rd July at The Coal Exchange in Cardiff) and loosely follows the Christmas Carol story with some extra twists and turns. Apparently there is a Yeti which will be making an appearance and the story will feature a 'Doctor' of christmas past, though which one is being maintained a tightly-guarded secret. Arriving on set for her first day of filming, Katherine Jenkins said: "I'm over the moon to be involved in the Doctor Who Christmas Special – I can't quite believe it as it's a part of the family tradition at the Jenkins household. I heard the news that I got the role on my 30th birthday and it was the best birthday present ever!" About the series, lead writer and executive producer, Steven Moffat, commented: "Oh, we're going for broke with this one. It's all your favourite Christmas movies at once, in an hour, with monsters and the Doctor and a honeymoon and – oh, you'll see. I've honestly never been so excited about writing anything. I was laughing madly as I typed along to Christmas songs in April. My neighbours loved it so much they all moved away and set up a website demanding my execution. But I'm fairly sure they did it ironically." The Christmas special follows on from Matt Smith's first series as The Doctor, which attracted huge critical acclaim for Smith, his companion, Gillan, and lead writer Moffat, from press and legions of fans alike.